Phone Number: (707) 745-6691 Office: From 680 north, cross the Martinez-Benicia toll bridge, and exit Bayshore. Go left at the stop sign and under the highway. Take a right onto Park Rd. beyond the stop sign and past the railroad tracks. Personality: Very friendly, but reserved. Dixie was a fifty-foot tall brachiosaur quite prominent from I-680; she is 71 feet long from the tip of her tail to the end of her snout and stands 50 feet tall. Dixie has one child, yet to hatch — it's feared the youngster may be stillborn yet Dixie continues to watch over it faithfully. Before moving to Benicia with her egg in July 1996, Dixie resided off I-80 in Dixon at one of her new owner's Cigarettes Cheaper! store, a national chain of retail cigarette stores. In the photo at right, Dixie is seen departing on her flight to Benicia. It was while living in Dixon that Dixie adopted her name, and efforts to change it to the more masculine Bennie have thus far failed. Note: Rumors circulated in late 2004 that Dixie has again moved, but to an undisclosed location. Do you know where Dixie is?? 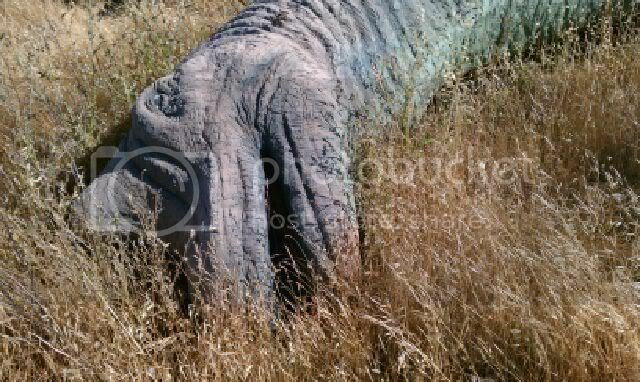 Update: The dinosaur was moved from Benicia to the owner's private home in the Napa area, and is no longer viewable to the public as of mid-2005. Update: Sorry but Dixie is dead. Burned to death in a wild fire on June 22 2008 while at the home of her owner Mr. John Roscoe at 17 Twin Sisters Rd, Green Valley, CA 94534. The area is not reachable/viewable from public roads.